Phantasy Star Online 2 is a local game for local people. 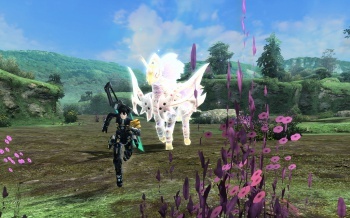 The PC version of PSo2 launched in Japan on July 4th, with a smartphone version to follow this winter. The western release isn't due until next year, but players have been importing the game and logging in from all over the world regardless. Sega hasn't given its reasons for closing the game's virtual borders. Some suggest it might be a token response to the allegations that foreign hackers were responsible for a series of pranks in which important NPC characters were placed out of reach or behind glass. The Japanese version of Phantasy Star Universe had a similar section in its terms of service, but no IP bans were ever issued. Even if Sega were to do so this time around, getting around a regional IP ban is trivially easy for anyone with the time and inclination to do so.